Watch the inaugural Distinguished Lecture Series event featuring The Honorable Rex W. Tillerson. 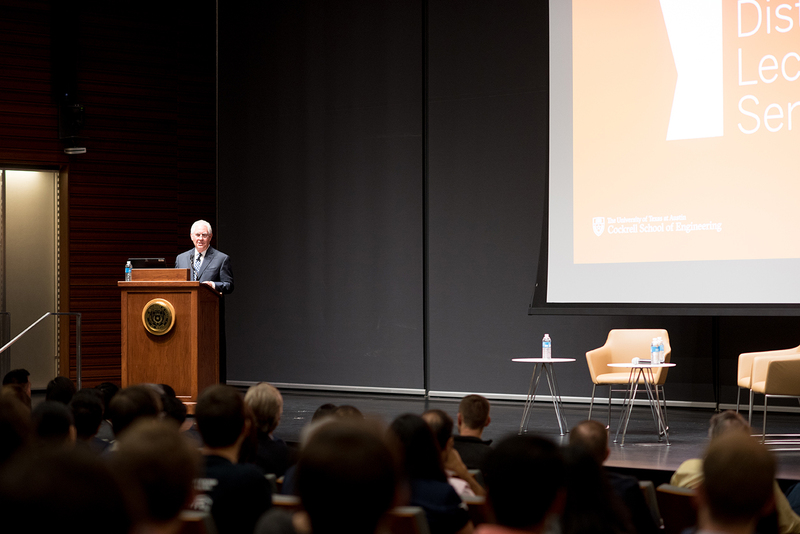 As the inaugural speaker of the new Cockrell School of Engineering Distinguished Lecture Series, Tillerson discussed the topic of leadership and ethics in a global society. He talked about his ascension at ExxonMobil, emphasized the importance of energy innovation, especially in Texas, and reminisced on his time as a Texas Engineering student. And one theme was central throughout his lecture and Q&A session — integrity. The Distinguished Lecture Series, which aims to bring influential technology, business and policy leaders from around the world to the Cockrell School, offers students an opportunity to hear and learn from successful individuals at the top of their fields. The event is led by the school’s Student Engineering Council and supported by the Texas Engineering Executive Education division. The inaugural event was held on Oct. 25, in the James J. and Miriam B. Mulva Auditorium in the school’s Engineering Education and Research Center. The Q&A session with student leaders elicited memories from Tillerson’s time on campus and thoughts on being an engineer who pivoted to executive roles. Throughout the lecture, Tillerson offered advice and lessons in management, being involved and how to use the engineering way of thinking to live a principle-based life. Tillerson graduated from UT Austin in 1975 with a degree in civil engineering and joined Exxon Co., U.S.A. the same year as a production engineer. He spent his entire career with ExxonMobil until holding the position of U.S. Secretary of State under the Trump administration until March 2018. In 2013, he was elected to the National Academy of Engineering. Tillerson has been a dedicated supporter of the Cockrell School and UT Austin for many years. He serves as a member of the school’s Engineering Advisory Board, the UT Development Board and the UT System Chancellor’s Council. He was named a Distinguished Engineering Graduate of the Cockrell School in 2006 and a UT Austin Distinguished Alumnus in 2007.